Bill Atkinson’s name will be familiar to many Apple fans. He’s the creative talent behind many Apple software gems like the Mac OS menu bar, Mac Paint, and more. Bill Atkinson is also a professional nature photographer. Bill Atkinson PhotoCard showcases his two talents by combining great software design and stunning imagery. Bill Atkinson PhotoCard makes it fun and easy to create beautiful postcards to send to friends and family. The postcards can either be e-mailed for free or sent via snail mail for around $2 anywhere in the U.S. or $3 in the rest of the world. (Apps like Postino and HazelMail provide a similar service, though far less effectively.) You can buy credits for postage using a PayPal account or a credit card. Put Your Stamp on Things: On the back of the custom postcard you create with Bill Atkinson PhotoCard, you can choose from around 150 stamps and even more stickers to place on your creation. To create a custom postcard in PhotoCard, you first choose a picture for the front of the card. The app comes loaded with 150 amazing nature photographs by Bill Atkinson for you to use. You can also use a picture from your iPhone’s photo library or just take a new one. Once you have selected the photo to use, you can pick from a few basic editing tools to crop, rotate, and darken or lighten the image. On the back of the card, you can enter your message in a number of different fonts and font sizes. You can also choose from around 150 different stamps and even more stickers to place on your postcard. 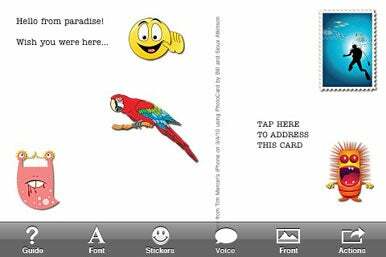 Once stickers are placed, you can move them anywhere on the back of the postcard by tapping and dragging them. PhotoCard even allows you to record a voice message to attach to your postcard. After you have finished creating the perfect postcard, you just choose whether to send it as traditional mail or as an e-mail. Bill Atkinson PhotoCard is very well designed and easy to use. Being able to send physical postcards via the Post Office from anywhere to anywhere in the world is really cool. If creating custom postcards anytime sounds like fun to you, you’ll definitely want to give this app a try.